THE SEA GLASS: These sea glass earrings were hand made with rare, genuine, hand picked seaglass beachcombed by me from a shore along the majestic Pacific Ocean shoreline. I live and hunt for sea glass all along the rocky rugged stretch of ocean called the "Pacific Ocean Graveyard", an area infamous for its hundreds of shipwrecks recorded since the early 1,700's on. These pieces are most likey from vintage bottle glass that's been tumbling naturally for decades. GIFT BOX & CARD: They will come in a cottoned lined a gift box and on a card that tells the short story of sea glass and gives the name of the ocean the pieces were beachcombed from. MEASUREMENTS AND MATERIALS: The sea glass pieces each measure just under 1/2" long. The sterling silver hoops are highest quality and measure .75" in diameter. QUALITY: All of the West Coast Sea Glass jewelry pieces are made of authentic beach glass that's never altered or artificially tumbled in any way. Their journey is what gives each piece history and a unique voyage. 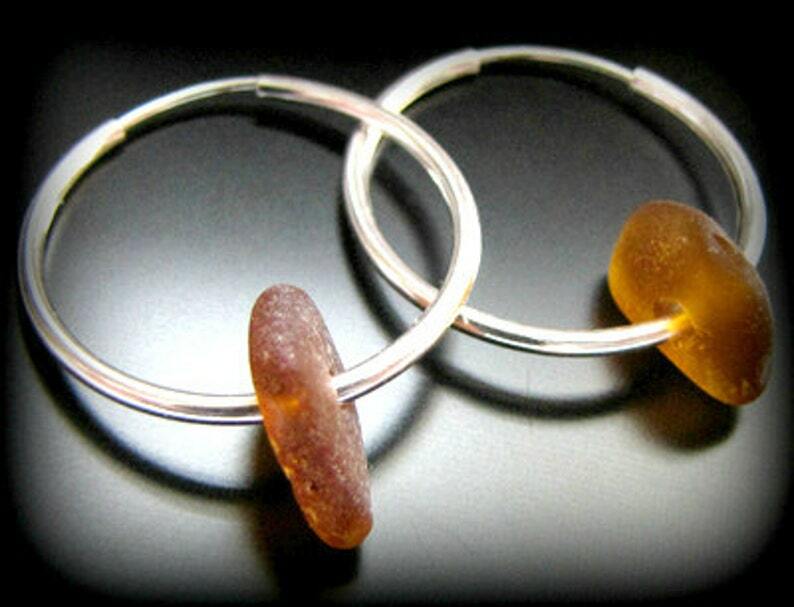 Our sea glass is placed into our artistic jewelry in the same ocean tumbled shape that it was beach combed in.